The second hull in Bilgin Yachts' 156 series has been named Lilium and is set to launch later next month. Built on-speculation, the 48 metre yacht follows the first hull in the series Nerissa (now named Starburst III), which was launched in August 2017. After being technically launched in April 2016, Lilium is now approaching completion. Her teak decks have been laid and stainless steel hand rails installed. Furniture was fitted earlier this month. 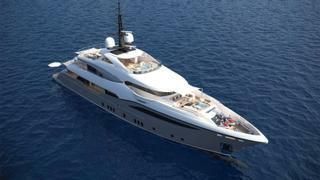 After her launch next month, she will undergo sea trials before making her debut at the Monaco Yacht Show in September. Bilgin Yachts chief executive İsmail Şengün explained the inspiration behind the yacht's name. "The Bilgin 156-II is named after the beautiful white flower Lilium as a sign of our promise to the yacht owners: A sunny and happy day on a deck." 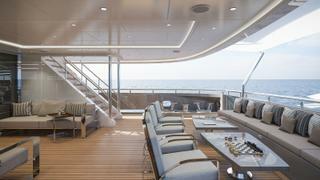 The yard has also revealed more information about Lilium's interior design. Created in-house, the interior decor centres around a "white colour palette with golden touches". Light colours dominate the living areas, creating a "peaceful brightness" while key materials include brass and marble. The galley meanwhile includes a kitchen island, while a pantry is located between the galley and living room. Chief executive of Unique Yacht Design, Emrecan Özgün added: “It is always exciting to see the end result of our designs. After the success of Nerissa, we can't wait to see how Lilium will affect the ones who see her. She is a proud example of today's globally recognised Turkish craftmanship." 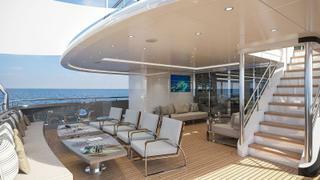 Lilium is a three-decked, full displacement yacht that can accommodate 10 guests in five cabins, as well as nine crew. The guest accommodation comprises a master-suite, two double rooms and two twins. Her two diesel MTU 12V2000 engines facilitate a cruising speed of 12 knots and top end of 16 knots.